Vape store owner Wally Gibson, left, shows Bert Brown a copy of an ad a competitor is running encouraging Kansans to avoid taxes by buying in Oklahoma. Brown, from Olathe, leads an advocacy group for vapers in Kansas City. Two years after the Kansas Legislature enacted its first special tax on e-cigarettes, the state is still trying to figure out how to enforce it and retailers are still saying they’ll be put out of business if it’s enforced. The tax — 20 cents per milliliter of vaping liquid — was tacked on to a larger bill at the end of the historically long and grinding 2015 session. There were no public hearings on the tax, which originally was supposed to go into effect in July 2016 but was pushed back to January 2017. It’s technically been in effect since last month, but the Kansas Department of Revenue is still trying to finalize rules for enforcing it and considers the tax voluntary until it does. 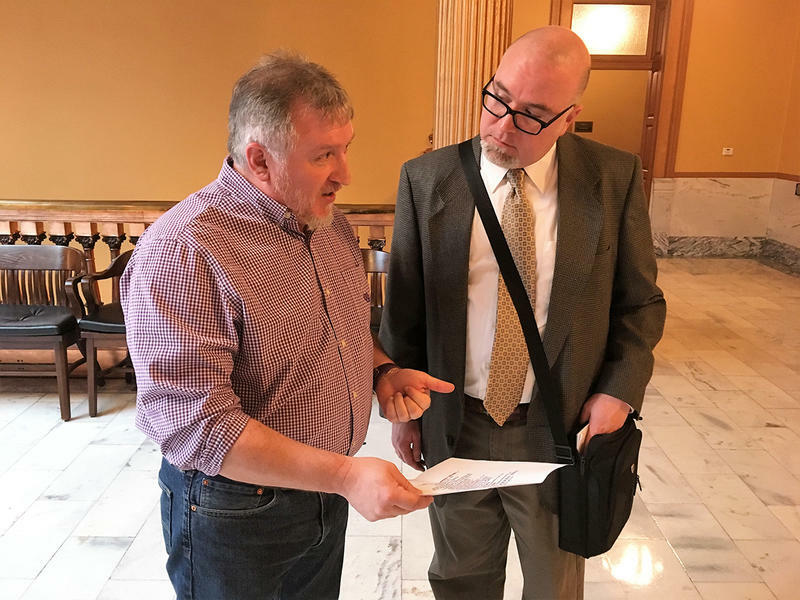 “It’s sort of been a mess, to put it mildly,” Spencer Duncan, a lobbyist who represents vape store owners, told the Senate Assessment and Taxation Committee on Tuesday. Duncan and the revenue department have been at odds over the wording of the 2015 bill and whether the 20-cent tax should apply to all of the vaping liquid contents or just the nicotine. If applied to the total liquid, Kansas’ tax would be more than twice as high as any other state. That’s a major complaint of store owners who have to compete with online sellers and stores in neighboring states that have no special tax on vaping products. “If this tax stays at 20 cents-per-milliliter, we’re going to lose a lot of business,” said Rob Lee of Pittsburg. Duncan said a half-dozen stores already have bolted for Missouri or Oklahoma. Wally Gibson, a vape store owner in Independence, Kan., said a competitor in Oklahoma is running radio ads urging Kansans to avoid the tax by shopping across the border. The 2015 tax was part of a package that also raised the special assessment on traditional cigarettes by 50 cents per pack. Legislators who voted for it viewed it as equal treatment of two competing products and a way to raise a small amount of revenue for the cash-strapped state. But vapor industry representatives said their tax is disproportionately harsh — especially for a product they say is less harmful to health than smoking. There’s debate about the health claim, because vaping products are less standardized than cigarettes and contain a variety of ingredients in differing amounts. The U.S. Food and Drug Administration just began regulating them last year. But the British Department of Health has determined vaping is less harmful than using tobacco, and doctors in Britain’s nationalized medical system can write prescriptions for vaping products as smoking cessation devices. Duncan and others at Tuesday’s tax hearing emphasized that role for vaping, rather than studies that show it can act as a sort of “gateway” to tobacco use for teens. Barb Lee Wilson, a retired nurse from Manhattan, told legislators that she tried everything to quit smoking and vaping was the only thing that worked. Wilson said the tax would keep other Kansans from being able to afford vaping products so they could quit tobacco. A public hearing on the revenue department’s attempt at making the final regulation is scheduled for March. The department has asked legislators to consider a bill further clarifying how to tax vaping products. Duncan is promoting a separate bill that would tax them based only on nicotine content but said he and his clients would accept a tax on the full liquid if the rate is drastically reduced. Andy Marso is a reporter for KCUR’s Kansas News Service, a collaboration of KCUR, Kansas Public Radio and KMUW covering health, education and politics in Kansas. You can reach him on Twitter @andymarso. Kansas News Service stories and photos may be republished at no cost with proper attribution and a link back to kcur.org. A study to be published in an upcoming issue of JAMA Pediatrics is the first to find a causal link between young people using e-cigarettes and then moving on to tobacco products. The study, funded by the National Cancer Institute, followed a national sample of 700 16- to 26-year-old non-smokers. When first surveyed, all of them said they did not think they would smoke a traditional cigarette within the next year, even if offered one by a friend. Gov. Sam Brownback’s budget proposal would sell the state’s future payments from tobacco companies to plug financial holes for the next two years. The budget proposal — outlined Wednesday morning — calls for the state to receive $265 million from “securitizing” the tobacco payments in fiscal year 2018, which starts in July, and the same amount in the following year. Kansas health advocates lauded the Food and Drug Administration’s decision Thursday to regulate electronic cigarettes, while those in the vaping industry pointed to harm to businesses and people trying to quit smoking. The FDA announced that it would ban selling or giving free samples of e-cigarettes and their nicotine cartridges, cigars, hookahs and pipe tobacco to people younger than 18. Kansas law already forbids the sale of e-cigarettes to minors.